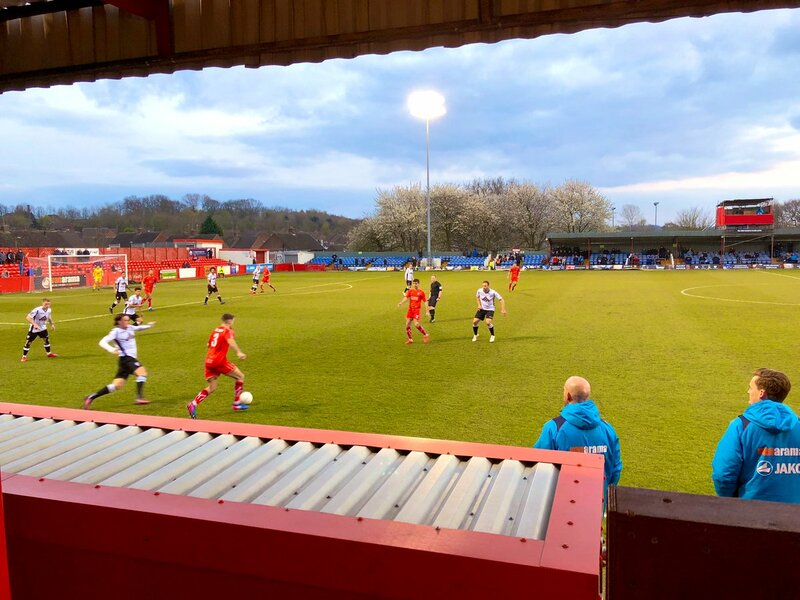 Richard Peniket's second half finish sealed a point for Billy Heath's Reds who reacted positively to Saturday's debacle against Altrincham, with a hard-working performance in a low-key contest on Tuesday night. Billy made four changes to the side that lost 7-0 on Saturday with David Lynch, Nathan Hotte, Dec Bacon and Richard Peniket all coming in. Tom Allan and James Clifton returned to the bench. The first half was certainly one of very few chances with both sides cancelling the other one out. Bacon and Josh Wilde provided early urgency down the left wing which brought several corners but all were cleared by the Bulls. Hereford were being pressed at the back-line with loose balls being latched onto by the Reds, another corner came for us but a breakdown in communication from Bobby Johnson and Platt saw the short corner fizzle out for a Bulls throw in. Greenslade had Hereford's first opening with a free kick, he hit it low with the ball then taking a deflection before Hotte reacted well to clear. Peniket had a sighter on 16 minutes but his effort was blazed over the bar after a loose ball came to him after a challenge on Dec Bacon in the box. We then came even closer with 28 gone and it proved to be the best chance of the half when Bacon turned well on the edge of the box and his shot across goal went inches wide of the far corner with Yates scrambling. Liburd headed at Sam Ramsbottom from a left wing cross as the first half came to a close with the Reds having the better openings but not doing enough to really get in behind the visitors. The second half continued in the same fashion, Bobby had a free kick and a corner which saw both set pieces cleared away. A returning James Clifton then fired just wide of the post from outside the box. Then with 56 minutes gone, Hereford were given a penalty out of the blue with a challenge from Martin Riley on Symons, the contact looked minimal with many Reds fans saying there was no contact at all. But the Referee saw the challenge worthy of a penalty which was converted by Owen-Evans at the car park end. The Reds responded ten minutes later with Peniket's finish after the initial header came off the bar leaving the striker with a tap in to level the scores. It should really have been 2-1 Hereford on 70 minutes when Liburd raced past Sam to nip the ball ahead of him, into the box Liburd found Symons who turned before firing wide of the empty net to the shock of all in the ground. It was a massive let off for the Reds with a huge chance gone for the Bulls, Sinnott fired a free kick way over before Hereford again came close with Sam denying Owen-Evans with a close range save, the rebound was then blocked before the third effort hit the post. The full time whistle came with a draw a fair result in what proved to be a low-key affair with the Bulls having good openings in the second half. It was much better from the Reds who grafted hard and showed plenty of effort but chances were mostly at a premium in an even game. Next up, we travel to Leamington on Saturday looking to return to winning ways for the first time since the 2-1 win at Nuneaton. Kick off is 3pm. ATFCXI: Ramsbottom, Lynch (Clifton 45), Wilde, Platt, Hotte, Riley (c), Bacon, Clarke, Curry, Johnson (Sinnott 74), Peniket. Subs Not Used: Styche, Nicholson, Allan.